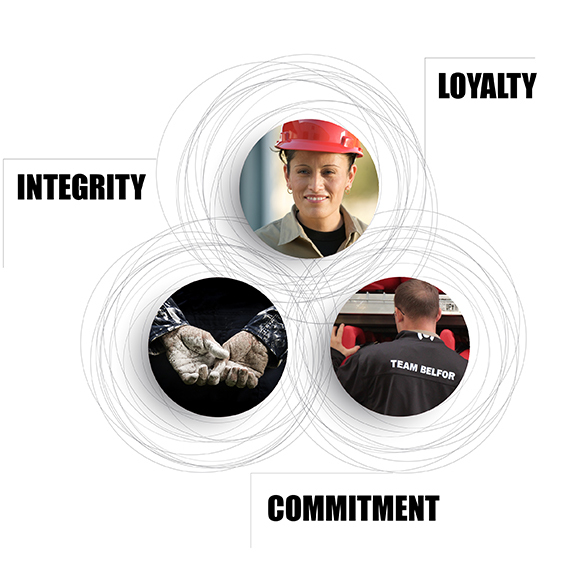 BELFOR’s mission is to be the leading provider of value-added solutions to our customers; to provide a secure and career-oriented environment for our employees; and to provide a fair and equitable return to our shareholders, all with truth, fairness and integrity. At BELFOR, we are “restoring more than property” – we are rebuilding homes and businesses destroyed by devastating losses. We are restoring pride in communities and we are restoring hope by making progress every day. Our culture is built upon the foundation of three basic principles: integrity, loyalty and commitment, to ourselves, to each other and to our customers. All of the BELFOR Holdings, Inc. companies accept a special obligation to the environment and its protection. For this reason, we always apply the most environmentally-friendly and lowest-impact restoration methods available. Our companies comply with all national and international environmental protection laws. In addition, BELFOR is committed to developing ways in which we can perform our business in a more sustainable manner. BELFOR leaders expect and encourage offices to support and give back to the communities in which they serve. Charitable causes vary greatly – from stocking local food banks to safety awareness campaigns to renovating properties for those in need.